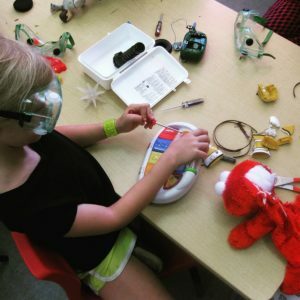 Tinkering Toy Shop: Tinker and design your own take-home toys and learn to code a robot with Eugene Women in Tech! Members: $35 first child, $10 each additional child in your family*. Non-members: $40 first child, $15 each additional child in your family*. *The $25 discount for additional children applies for a maximum of 5 children/family. Children must be registered during one single transaction for the discount to apply.